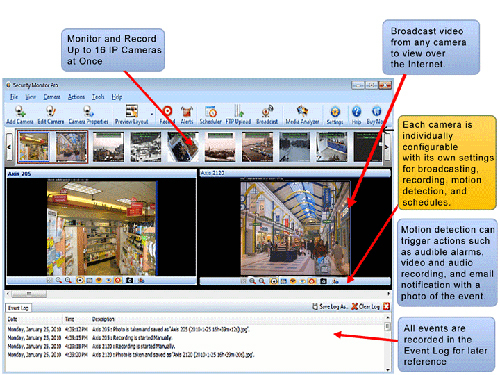 This professional Surveillance Software package can monitor and record from multiple cameras simultaneously using a single PC. Each camera has its own settings for sensitivity, recording, and alerts. You have full control and the flexibility to customize your system and secure the coverage area. Monitor large areas like parking lots, shops, offices, and warehouses from a single workstation. You can configure the program to record audio and video, take snaps, sound an alarm, or send email. Each camera has its own alert settings. Each camera can be set to start and stop monitoring at set times, on particular days of the week, automatically. Get immediate email notification when motion is detected. Security Monitor Pro can automatically upload recorded video and snaps to an FTP server of your choice for safe off-site storage, or remote viewing on a web site. You can also watch a live video feed for each of your cameras, from anywhere. Now you will always know what happens at your business. All events are recorded in an event log and displayed for quick reference. Video and photo recordings are grouped and sorted for each camera with time and date stamps. Security Monitor Pro preserves evidence of all activities for later use. * Monitor and record up to 16 networked IP cameras, simultaneously. * Monitor and record up to 4 USB cameras, simultaneously. * Schedule each camera to start and stop monitoring automatically, on a daily or weekly basis. * Configure each camera with its own unique settings for motion detection, recording, and video streaming. * Stamp recorded video and snaps with date and time for legal purposes. * Receive notification of all motion and noise alerts by e-mail. * View all video recordings and snaps using Media Analyzer tool. * Upload recorded videos and snaps to any FTP server, for secure storage or web site viewing. * Digitally zoom any camera up to 400%. * Use any of more than 600 different IP camera models.